You can now become a Regional Vice President, or even a Senior Vice President with TopNetworkersGroup. We’ve created two higher positions as well for the ones that really want to be part of our Movement – who believe in what we believe. We believe that the 5th Wave of Network Marketing is HERE – and that means the MLM industry has now become accepted by Most Businesses as the perfect model to move products to consumers. This means that more and more MLM companies are being started and more and more “networks” are being pulled apart. It’s Human Nature to want to be first – Emotional decisions get the best of us all. Most of us make them in just about all areas of our lives. However, in my first MLM Company, I was taught that Customers make emotional decisions. I Sold telecommunications and electricity services – things most people were already paying for. If I could show people a way to save money on these services, I’d ask them to do ME a Huge Favor, and give my services a Try. This works to this day – with just about everything else I do. The key is not to sell those customers on the facts. So what if my services were cheaper – the selling point was that they would be doing me a Huge Favor – if they valued me or my relationship to them, then asking them to get their services through me is not that big of a deal. Relationships would end when people made it about the facts, and took it ‘too personal’ when potential customers would say no. Sure we’d use the language, and lean on the relationship — but it’s a bluff; Like playing Poker. We’re playing on the ’emotions’ … rather than trying to convince them on facts. Why? —- If you get a customer on facts; you lose them on facts too. If you knew the Facts about YOUR MLM Company – You’d start to see things our way. I Thank the perspective provided by Experience. I had a sponsor that quit on me. I had Uplines that didn’t believe in me and gave no support. I’ve had business partners who stole people out of my downline, and I’ve even had companies go Out of Business on me. I’ve had several bad experiences in MLM – and I’ve used them all to create a guideline and a roadmap for others to follow; to organize a team that approaches MLM “the right way” – a team that will GROW and LAST for decades to come; and will withstand the winds of change that are ever present – especially within MLM. You see, when you build your mlm organization around ‘a company’ – what happens when people in your downline see a new company? The mentality of networkers must change – and that’s our goal with members of our team; to Change their mentality first. We must think more about who we are in business with, than what company we are in. Does your upline understand the importance of doing 3 ways? Do they understand Edification? Do they Understand how to Give Presentations? Do they Place importance on Training? Are They Concerned with Your Personal Growth and Development? Are they growing themselves? These are VERY important questions to ask – and yet in spite of having a Team approach, the VISION of TNG was not nearly as clear as it needed to be. How can we know that we’re working with someone who’s TRULY the best – really knows their stuff – Can actually help Lead and Grow a team? How can we know we’re working with others that will help us make money in several places – not just one.How can we grow a team, and keep that team Together? We feel that the introduction of our leadership ranks, now gives us the ability to know these things. You can now become a Regional Vice President, with topNetworkersgroup. Based on our Calculations, an RVP will sit on top of an Organization of approximately 20,000 Team Members – which will include a minimum of 3 Regional Directors, 9 Managing Directors, 27 Executive Directors, and 81 Team Directors – You will have an actual Organization filled with Leaders – and producers who are all thinking like we think. One correction to the video above. The “Team Member” rank is not an actual “leadership rank” – We now have 2 starting positions with TNG – The first is a Customer; and the second is Team Member. As a “team member” we’ll officially consider you as part of our team. Otherwise, you’re simply a customer, with the option of officially joining us at any time. 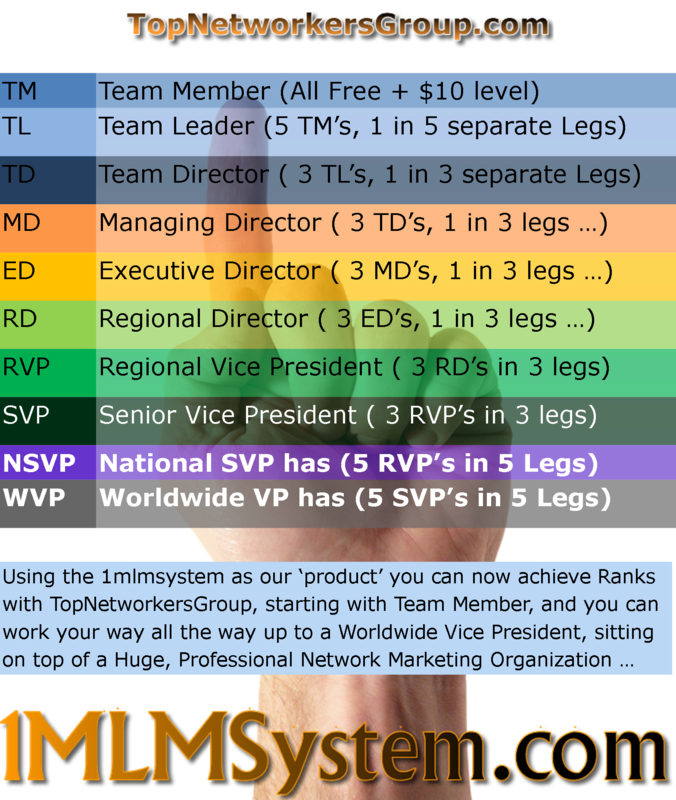 In December 2012, we launched the 1mlmsystem – which allows you to JOIN TNG, and start working with us; getting our training, working with our group, making money in several affiliate programs and mlm companies – Together – Review the Chart – of our NEW leadership ranks.